London, present day - and Queen Victoria still rules with an immortal fist. She's the undead matriarch of a Britain where the Aristocracy is made up of werewolves and vampires, where goblins live underground and mothers know better than to let their children out after dark. A world where technology lives side by side with magic, where being nobility means being infected with the Plague (side effects include undeath) and Hysteria is the popular affliction of the day. Xandra Varden is a member of the elite Royal Guard, and it's her duty to protect the Aristocracy. But things get complicated when her sister goes missing. Xandra will not only realise she's the prize in a dangerous power struggle - but she'll also uncover a conspiracy that threatens to topple the empire itself. As soon as I saw the cover I knew I wanted to read God Save the Queen - it was the combination of the steampunk style outfit with modern London buildings in the background that raised my curiosity. You've got to love a heroine with bright red hair too! 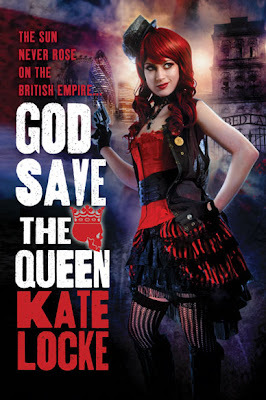 Reading the blurb and discovering Kate Locke has created an alternate history where Queen Victoria didn't die - she was actually infected with the plague and became a vampire - just sealed the deal and moved this onto my 'must read' pile of books. Imagine a world where Queen Victoria is celebrating her 175 year on the throne, a world where the British Aristocracy were all infected with a plague that turned them into vampires. The same plague that turned the Scottish Aristocracy into werewolves but didn't really have any effect on the main population. You have a world full of steampunk technology, where women wear corsets and where your heritage dictates your place in society. You also have a story that is a mixture of urban fantasy, alternate history and steampunk - in other words a story that is full of awesome. Our heroine is Xandra, a 22 year old halvie who was born of a vampire father and a human courtesan and who now works for the Royal Guard protecting the Aristocracy. When her sister Dede goes missing and is presumed dead Xandra is the only one who doesn't believe what she is told, she is convinced that her sister is still out there somewhere and is determined to find out what happened to her. Even Xandra's brother Val and her other sister Avery believe that Dede is dead so she is on her own when it comes to the investigation. The more Xandra starts digging into Dede's disappearance the more she starts to uncover about her own past and the secrets those she is closest to have been keeping from her. Xandra is the kind of character I find it easy to care for, she is strong and independent but she is also caring and she knows when to accept the help that is offered to her. She has been kept in the dark for her whole life and everything she thinks she knows is completely turned upside down throughout the story. I can't say much more without giving spoilers so I'm just going to say I was impressed with the way she coped with the revelations that were thrown at her. I really found myself liking her family unit, particularly the relationships she has with her siblings but some of the characters I'm most interested in finding out more about are Vex (the Alpha of the British werewolves) and the Goblin Prince. I have a feeling there are a lot more secrets still to uncover and I'll be interested to see how the story develops in the next book. Considering God Save the Queen was written by an American author it had an authentic British feel to it that I really enjoyed. Add in a great cast of characters, a mystery that kept me guessing and some fabulous world building and this is a book you won't want to miss out on. I can't wait to get my hands on the next instalment and will definitely be adding Kate Locke to my list of authors to watch out for. This is another series I've loved Iza, the great news is that the entire trilogy has been published now so you won't have to wait between releases :o) I hope you love it as much as I do!